The Missing Pieces of the Fibromyalgia Puzzle is the book that changes everything for patients, healthcare providers, and everyone with an interest in truly understanding fibromyalgia and chronic widespread pain. The Missing Pieces of the Fibromyalgia Puzzle is the most ground-breaking and transformational book ever written on fibromyalgia and chronic widespread musculoskeletal pain. It does what no other book or publication has ever been capable of doing. Through original, cutting edge clinical research results and evidence-based analysis, it actually identifies the cause of pain in fibromyalgia, the mechanism by which it evolves, how it is modulated, and how to effectively treat it. This compelling, scholarly, yet immensely accessible new knowledge demystifies fibromyalgia and chronic widespread musculoskeletal pain and makes everything that is unknown about the relationships between pain,tenderness, disability, sleep, weight related issues, psychological and psychosocial disturbances, and sexual difficulties clear and understandable. Written for patients and healthcare providers, The Missing Pieces of the Fibromyalgia Puzzle will transform the lives of individuals afflicted with fibromyalgia and chronic widespread pain. Its enlightening blend of traditional and complementary therapies guides and empowers them and their healthcare providers with the most unique,integrated, and thoroughly effective self-managed wellness recovery program ever published. It provides the substrate of truly justified hope and faith in the ability of individuals to transcend the suffering of fibromyalgia to make positive changes in their health and overall well-being. 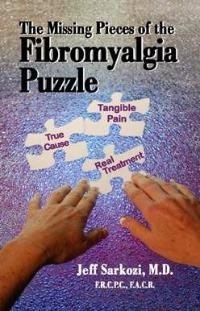 Written by Jeff Sarkozi, M.D., F.R.C.P.C.,F.A.C.R., a rheumatologist expert specializing in the diagnosis and treatment of fibromyalgia and chronic widespread musculoskeletal pain, The Missing Pieces of the Fibromyalgia Puzzle offers the type of revolutionary insight and understanding that redefines the landscape of fibromyalgia knowledge, diagnosis, and treatment.